Out goes the Homo Sapiens and into oblivion. In comes Homo Superior, the new transhuman. We are living in unprecedented times. Humans no longer love being humans. God’s beautifully crafted man-woman relationship is forcefully being displaced by unnatural LGBT’s demands. And for the rich and powerful, subservience to their rulership is the game. Since they cannot control the will of man, the other best option is to create a new slew of robots to serve. Man’s ingenuity cannot be under-estimated. The robots are not hard machines, but will be as human as you can imagine. 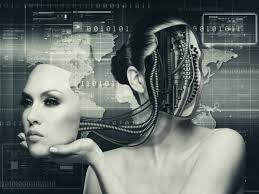 Transhumans – you cannot tell the difference between man and machine. That’s the New World Order. With so many people unemployed around the world, particularly in industrial nations, further complicating the already bleak unemployment prospects it now appears that the global elite are moving to make human beings obsolete. Also included below are 4 of the most shocking charts of 2015! The following charts are from the Wall Street Journal. 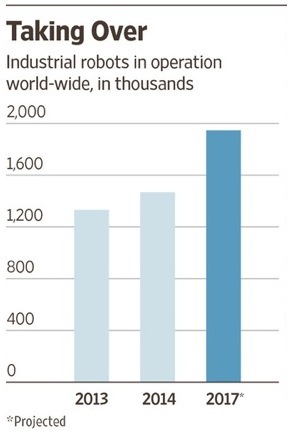 The first chart below from WSJ shows the number of industrial robots in operation worldwide, in thousands. Notice the dramatic increase in the use of robots that is expected by the year 2017. …. There is no question that this will all end badly, it’s just a question of how much human suffering will take place as human beings begin to be viewed as disposable by the major corporations that run the world? See the rest of the charts here. This entry was posted on June 12, 2015, 10:18 pm and is filed under Lifestyle, Social. You can follow any responses to this entry through RSS 2.0. Responses are currently closed, but you can trackback from your own site.